Vision comes to normal and relaxed eyes as effortlessly as... scent to the nostrils, music to the ear or the touch of velvet to the fingertips. In the following you will read about how you can improve or completely return your vision to normal and experience healthy eyes again, whether you are, nearsighted, farsighted, astigmatic, hyperopic, amblyopic, have nystagmus, macular degeneration, glaucoma, strabismus, cataract, ptosis (drooping eyelid), bells’ palsy, fibromyalgia, keratoconus, eye fatigue, headaches, dry eyes, light sensitivity or computer eyestrain, Eye-Robics will assist you to clarity and normal healthy eyes free of symptoms of dis-ease. All other hard copy books and e-programs 60 day unconditional money back guarantee. The Eye-Robics vision drills help my eyes to relax so that I am not afraid to see. Usually, before sunning (one vision relaxation drill) I would not allow myself to see, for fear that I would surprise myself or that it would hurt to visualize something far away. The 34 year old man had experienced progressive myopia since age nine. Prior to starting vision training his vision measured at 20/1600 each eye. His prescription measurement was -9.00 diopters. Without his glasses he was unable to distinguish people from three feet. He had a constant fear that he would lose his glasses. After 13 months of Eye-Robics vision training program his vision measured 20/80 in each eye. (He was elated, for the first time, he could go to the beach and play in the surf. A professor at one of the local Universities, he had not been able to correct papers at normal desk distance nor could he see the computer terminal screen without glasses. For the first time in many years he could do these tasks easily and see them clearly. He eventually drove without glasses and essentially does everything now without glasses. This 39 year old man had experienced progressive myopia since age eight. He had worn contacts off and on for 20 years. Prior to starting vision training his vision was 20/500 each eye. His prescription reading was -7.25 diopters each eye. He started the Eye-Robics vision training. Two months later he was tested by the optometrist and measured 20/300 each eye. Six weeks later he went into the optometrist again and was tested or weaker lenses and was measured at 20/100 in each eye. Two months later he returned to the optometrist and was tested again. This time he measured 20/60 in each eye. Dear Dr. Taber. Words cannot express my gratitude for your Eye-Robics program and your hours of care and tender training and guidance. My eyes and mind work so smoothly and my world was greatly brightened. My eyes will never return to the tense blurs that use to be. I am grateful for the tools and techniques in the program as it allows me to keep the good vision I have attained. This man was 32 years old when he ordered the Eye-Robics program. He lived in Tennessee and at the time was a pilot for a small airline company. His vision measured 20/400 each eye. His prescription measurement was R= -6.00 diopters, L= -7.00 diopters. . He wanted to improve his vision so that he could qualify for a higher pilot rating. He reported to me in January 1986 that he passed the visual requirement for Piedmont Airlines which is 20/50 visual acuity. This man was highly motivated. This is an example where motivation, purpose, persistence, and dedication pay high dividends. I wanted to drop you a note and let you know how happyI am with your Vision Training Program. I was very skeptical when I first talked to you. I couldn’t believe a program so simple could have such tremendous results. I always hated wearing glasses. As you know I was trying to make a career change, but my poor eyesight would not permit it. Because of your “Eye-Robics” program I will soon have the position that I really want. I cannot thank you enough. Please feel free to tell others about the success I have had. I started vision training to correct an imbalance that I felt lingering even after an extensive course of nutritional and physical therapy recommended by my doctor. Intuitively I knew that I could not be in balance with a daily dependence on an external mediating crutch, my eyeglasses. Within a short time after starting the Eye-Robics vision training program, I began experiencing the true meaning of balance: self confidence, clarity of purpose, willingness to accept responsibilities, assertiveness and the ability to handle stress without letting it get out of hand. Not only have I regained clear vision after 20 years of corrective lenses, but I feel good about myself all the time. I have enjoyed using your Eye-Robics program. I recently passed my drivers exam without glasses after having worn them for 31 years. At one point I was up to 20/900 (a -7 diopter lens). I can’t thank you enough for this knowledge. Myopic (Nearsighted)---Improved by just doing a few of the Eye-Robics vision training eye drills presented in an article in the “Mother Earth News” magazine. Since reading your article in the “Mother Earth News”, which presented techniques and information about your Eye-Robics program; I have been using the techniques presented. After 3 weeks, I can see quite a number of things and views that before could only be seen through the glasses. I’ve been wearing glasses for 40 years and each year they become thicker. So it is indeed a thrill to find I can see without glasses! I would just like to say thank you for your Eye-Robics vision training program and audio cassettes. . I have been using your suggestions and tapes and am finding quite an improvement in my mental and physical vision. I still have a little astigmatism but am improving as well. I no longer wear glasses and my eyesight continues to improve. I still do the Eye-Robics drills and techniques you gave me everyday before I go to work; which includes 8 hours on a computer screen all day. This morning I watched the majesty of the clouds and marveled that when I first came to you I had lost the ability to see clearly in the far distance. In fact, close and far had begun to disappear. It was a scary prospect for me and there was no easy solution. 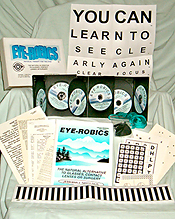 I began your series of relaxation and eye exercises, the Eye-Robics program and in a short time I was free of the stress and seeing so much clearer. Thank you for helping me to see clearly again. This man was 32 years old when he ordered the Eye-Robics program. He lived in Tennessee and at the time was a pilot for a small airline company. His vision measured 20/400 each eye. His prescription measurement was R= -6.00 diopters, L= -7.00 diopters. He wanted to improve his vision so that he could qualify for a higher pilot rating. I just wanted to thank you for helping me regain my eyesight. I had Lasik surgery March of 2003. My eyesight was restored to 20/15. By 2004 my vision was beginning to get weaker. I took your class starting the end of September 2004. I believe my eyesight was 20/60. After taking your class, by the end of February 2005, my vision was better than after the eye surgery. My eyesight was 20/8 in both eyes!!! I have learned skills that have helped me retain my vision. I also got in touch with the emotional aspects of vision that caused me to become myopic. By releasing the emotional past cleared my vision as well as learning to relax. My mother has also tried your techniques and even though she has not done them continuously, she has noticed improvement. I continue to use your methods and when I have stopped and been under stress and notice my vision starting to be a little weaker, I just start my exercises again, and viola, back in business. I LOVE HAVING 20/8 vision!!! Before doing the Eye-Robics vision training program my world was stressed and my two eyes did not work well together. Now I see the world clearly through my own two eyes. It’s great to be free of glasses and stress. Words cannot say the many things you and the Eye-Robics program have done for me. Words cannot convey how thankful I am. You have changed my life.